To help promote safe digging you can order the following items. Scroll down to find the item you need, fill out the request form and submit it. Please allow 10 business days for shipping. If you have any questions, please contact Maria Copeland at 770.757.6467 or Click Here to email her. 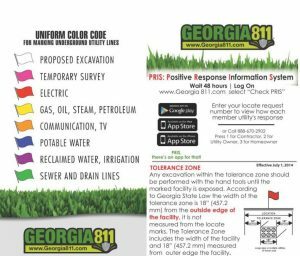 If you do not dig in Georgia, please go to www.call811.com to get the website or phone number of the One Call Center for the state you dig in. The following items are available to individuals/companies who dig in Georgia. APWA color code cards with Positive Response contact info on back. Available in English in version. Packaged 250 per pack or individual Please specify the quantity example 1=1; 250=250! We have a variety of videos that are both instructional and informative for locaters, contractors, excavators and their crews. They are available for loan from our video library, so we encourage you to check them out and share those videos with your people. To check out a video, you may use the video loan form or contact Maria Copeland at 770-476-6035, email mcopeland@Georgia811.com. Through Georgia 811’s partnership with the Georgia Hispanic Construction Association, we now have a “Sed de Saber” English language learning tool kit available for free rental. If you have Spanish speaking workers looking to enrich their construction English vocabulary please contact Megan Estes atmestes@Georgia811.com. Follow a locate technician through an average day in the utility locating world. Accidents occurring during 2003 are covered by DD video-Digging Dangers 15, Digger Nightmares continued. These accidents happened in Massachusetts, Ontario, Indiana, Georgia, New Mexico, Delaware and California. The worst accident depicted killed seven people when a strip mall in Toronto was leveled by a gas explosion after the mall’s unmarked service line was damaged by an excavator. This new 15-minute video also revisits a 1998 accident in Attleboro MA. The families of two city workers killed in a gas explosion there received the highest cash settlement in Massachusetts history. The objective of the Digging Dangers videos is to raise awareness of what is happening, so that viewers can take steps to keep it from happening to them. This video covers some of the worst excavation accidents of 2004. Viewers see an on-the-scene portrayal of a backhoe hit on a jet fuel line in Walnut Creek CA that killed five workers. This 20-minute video also covers a Belgium pipeline explosion that killed 24 and injured 100, a gas pipeline explosion near Madrid IA, two Dallas TX firefighters overcome by gas while responding to pipeline damage, an Evansville IN gas explosion that killed two, a water main hit that flooded streets in Ft. Lauderdale, FL, a gas explosion in Hammond IN, a worker injured by gas explosion near Detroit, a Philadelphia gas main inferno that made national news, and two homes destroyed in a gas explosion in Fairfax, OK. The video also revisits the 2003 gas explosion that killed seven in Toronto. The son of one of the victims appears on camera to give his personal account of the accident and its aftermath. Digging Dangers 17 BOOM! underlines the importance of safety when dealing with the aftermath of underground utility damages. We highlight excavation accidents occurring from late 2004 through the end of 2005. These accidents will help construction workers, utility personnel and first-responders understand the firsthand effect of not following safety precautions, particularly when faced with leaking gas. This video features accidents from the last four months of 2005 and the first seven months of 2006. Discussion covers the difference between preventing damage and preventing a disaster. Learn how the response to an accident can cause resolution or havoc. This video stresses the importance of a well planned and orchestrated response to a digging accident. Digging Dangers 19 features excavation accidents from 2007. This video explores the issue of the responsibilities all stakeholders share during excavation and how those responsibilities relate to business ethics. “Failure to…..” features excavation accidents from 2008. A fatal explosion in 2008 in Plum Grove, PA was caused by damage to the gas main in 2003. Digging Dangers 21 features excavation accidents from 2010, including one caused by a crossbore. Accidents include Cleburne, TX, Darrouzett, TX, Thomson, GA, Columbia Falls, MT, Edina, MN and more. Contains interview with a utility superintendent whose sewer lateral was damaged by directional boring which led to H2S poisoning. In addition, a first hand account of the West Haverstraw, NY accident, taken at the scene. Compilation of excavation accidents involving buried utilities in 2013, including pipeline damage and gas explosions. The demand on critical infrastructure around the world has never been higher. New utilities are going into the ground at an incredible rate, crowding already cluttered right-of-ways. Whether it’s a homeowner installing a fence, a contractor building a new road, or a utility planning a major service expansion, damage prevention challenges have never been greater than they are today. This series of damages from 2013 illustrates the obvious. Despite the pressures of today’s excavation industry, workers must remain vigilant and resist the temptation to cut corners. The worst excavation disasters are often those that could have been easily prevented. With one strike of the clock, lives can be altered forever. Our comprehensive yet engaging approach to buried utility damages over the past year helps encourage safe excavation practices and better damage response in the future. Damage prevention isn’t over when utilities are marked. Knowing the colors and meaning of utility markers is only part of the answer to safe, damage-free digging. This video has 29 minutes of quality instruction. This video addressees the old cliché, “Locating is an art, not a science.” Our aim: 1) Provide visual insight to the factors that support the cliché, and 2) offer advice to the user of the locating instrument when these factors arise. In one sense, we are trying to help folks “see” the reason for hand-dig, tolerance zones. Additionally, we offer information for the instrument user to identify and, perhaps, overcome these factors. 20 minutes. 5 Red’s 5-Steps to Safer Digging – Entertaining and light approach to safety awareness for various audiences (Running Time 12 min, 30 sec) , Call 811 for Kids- Ideal for kids 8 to 11, this pirate adventure shares the basics of calling 811 (Running Time 7 min) and 5-Steps to Safer Digging Toolbox- Informative and engaging safety awareness for professional excavators (Running Time 9 min, 40 sec). “On November 19th, 1998, it was a chilly morning and a typical workday for me…” And so began the day that would change Cliff Meidl’s life forever, the day he nearly lost his life on an excavation site. Cliff’s story of recovery and perseverance following the tragic accident is truly inspiring, from simply learning to walk again, to beating the odds and making the U.S. Olympic Team- twice. It is an important reminder to us all, that accidents can happen to anyone. Dedication to the goal of safe digging is a shared responsibility…between the excavator, the locator, the facility operators, and the 811 communication centers that connect them (Running Time 9 min, 45 sec). This video thoroughly covers the range of key safety behaviors that contractors need to apply when working near overhead or underground electric power lines. Well-tested, it’s proven to convey concepts in a way that successfully motivates contractors to take action. Content supports the OSHA Cranes and Derricks in Construction Rule. Crystal-clear photos show what to do and simply worded instructions increase understanding. This video is a trusted standard used by many utilities across North America (Running Time 15 minutes). This video also features Cliff Meidl’s accident.